Skin Laser is a specialized clinic that offers state-of-the-art expert treatments for skin ailments. In addition to the conventional therapy for skin disorders, advanced laser and light-based treatments for recalcitrant skin diseases are provided by skilled and experienced professionals in the very tranquil environment of purpose-built premises of Skin Laser. 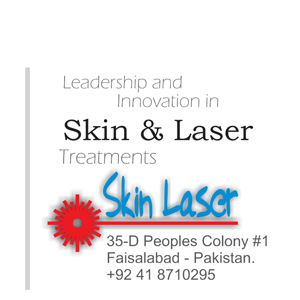 Skin Laser is owned and headed by Prof. Shahid Javaid Akhtar. He is a talented, skilled, and renowned doctor with more than 20 years of experience in Dermatology.